I’ve been single for more than two years now, so it’s interesting that I’m still dealing with things. By “things” I don’t mean the emotions of divorce. I mean actual things. When I moved to my new home, I did a pretty good job of sorting through things. I had a sense that it wouldn’t get any easier to deal with the “stuff” we’d accumulated in 30-years of marriage, so I tried my best to go through things as I packed up to move on. No matter how amicable the divorce, dividing up possessions gleaned over many years is difficult. Some things were easy; dishes, pots and pans, and towels. Other things weren’t easy at all and those were the things with memories tied to them. Who keeps the photo albums? The gift given to both of us? The Christmas ornaments? Every divorce is different, just as every marriage is. There are things that are more pronounced, the longer you are married. Of my 50-years on this earth, 19 of them were spent single and 31 were spent married. That’s huge. Think about it. Nearly all of my adult memories are tied to my now ex-husband. Untangling my life from his is impossible. The paper might say “divorce decree” but that’s the only part of it that’s concrete. The rest is gray area; the black and white smudged together in a way that can’t be simply undone. And of course since most of those 31-years were shared with our children, those yarns hold even tighter. In the Pacific Northwest, we are setting records for high temperatures. My hometown has been the highest temp in the nation this summer as well as setting a record for the most days above 100 degrees. My “This old house” project home is moaning in the heat, as the window air conditioner keeps on blowing, like the little engine that could. Even so, my efforts have turned to a much cooler time of year. Why in the world am I talking about Christmas in the middle of a heat wave? Well, because it’s time, that’s why. Last Christmas marked a lot of firsts for me. It was my first Christmas as a divorcee. It was my first Christmas in my new house. 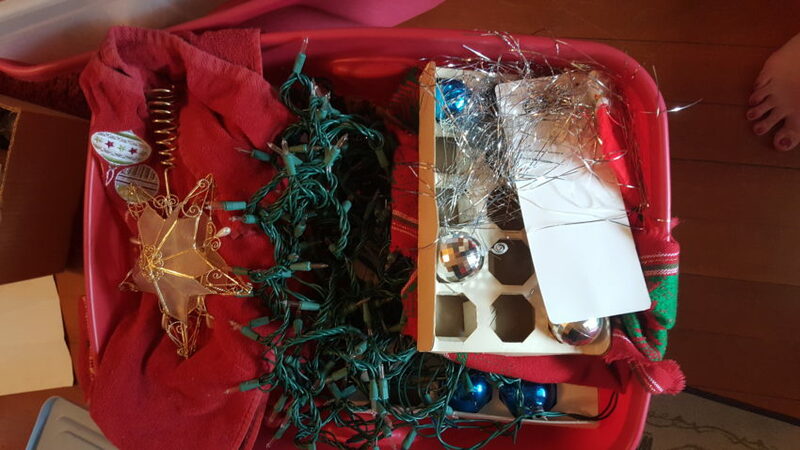 For the first time in 30-years, I would make all the decisions myself; whether to get a tree or not, how to decorate, and what about putting lights up outside? I’ve always loved Christmas. I love the smells, the sights and sounds. My rule is that I have to let Thanksgiving pass before turning on my Christmas CD’s. Yes, I have to have a rule for that. As a married person, Christmas held a lot of meaning too. My husband and I started many, many traditions with our children. A lot of those were passed down from my own childhood Christmases. We packed the kids in the car to go see all the Christmas lights. We filled stockings on Christmas Eve. We got a tree from Klicker’s Berry Farm and decorated it with ornaments we’d received as gifts or that we’d picked up on special travels. There was always the Hawaiian Santa made of dough, and the stork we got when we were pregnant with our first child, and many others. 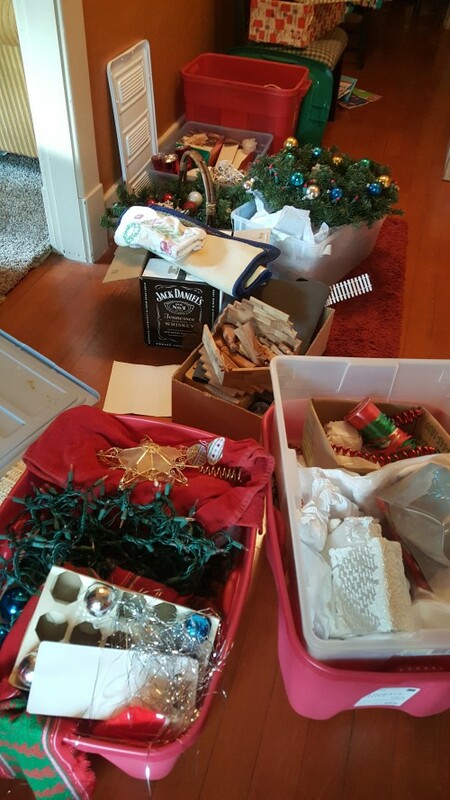 Each ornament was carefully brought out of the boxes with the memories attached. “Hey, remember this one?” one of us would exclaim. The kids were mostly immune from this trip down memory lane – not remembering or caring about the attached memories. The nativity set was a gift from my mom – just like the one I’d grown up with. Made of wood, it was hand-carved in Bethlehem. And though over the years, the boys would sneak the wise men and kings from the set to play with their army men, the set remained unchanged, though Baby Jesus did go missing for a while year one year. It’s only in letting go that you figure out who you really are. 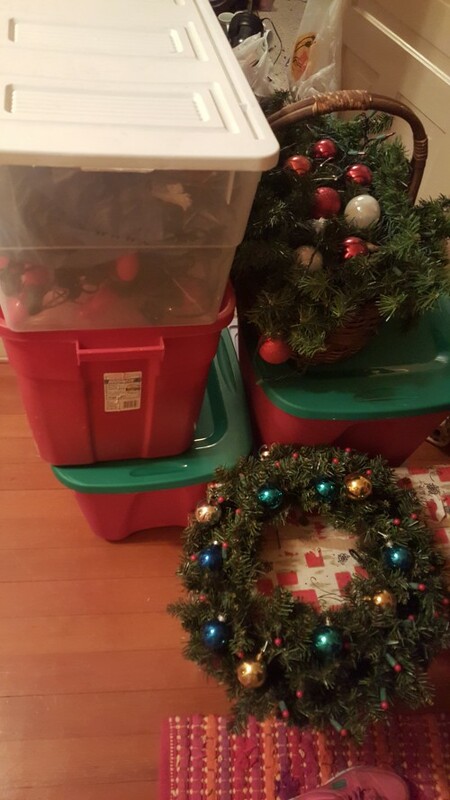 When I moved from my married house, where we’d lived for 24-years, I knew I’d move the Christmas things with me. They were in a mishmash of boxes and bins, in the upstairs closet. For months, I’d had a plan. I was going to go through those boxes and bins and divide up our Christmas memories. Though Christmas was fun for my husband, it was really my doing. I was sure I could divide things up evenly, in a way that would make us both happy. The time to move grew closer. I went upstairs and took the lid off of a big red bin. It was filled with Christmas lights. I dragged the tangle of lights out and plugged them into the outlet in the hallway. Of about 15 strands, only a handful worked. Proud of myself, I made a trip to the garbage – finally tossing the ones that were hopelessly dysfunctional. Back upstairs, I opened a smaller plastic bin with a white lid. Inside, the Hawaiian Santa Claus stared up at me. I unwrapped a small bundle. It was the stork we’d bought at my insistence on a trip; I was sick to my stomach the whole time and thought I might be pregnant. I was right; Baby Girl was born 7 1/2 months later. I sat back in the closet. All those memories. Were they for nothing? Were we doing the right thing – divorcing? I knew deep inside that it was the right thing, but inside that closet, I was overcome. I felt as if I was divorcing the memories too. Where would the memories go when we divorced? We’d been bound for 30-years; every adult memory I had was tied to my husband. And when he was my ex-husband, what then? I couldn’t just stop remembering him. 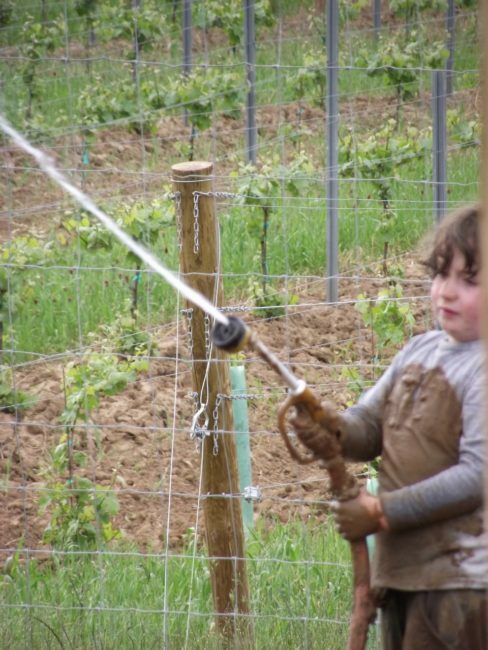 I could never untie what bound us together – our children. Our children. They’d always be ours, not mine or his – ours. That would never change. I snapped the plastic lid back on the bin. I carried it downstairs and made a special spot for the Christmas things. One by one I carried every bin and box down and placed it with the things I would hand-carry to my new house – things too precious to trust anyone else with. When I moved, a few days later, I piled the boxes in my car and took them to the new house. Eventually, they found a place in a spare bedroom, in a closet. Those decorations took up the entire closet. I slid the closet door shut. Freedom is the reward of letting go. The Thanksgiving feast finished, I turned on my Christmas music and dragged a few of the bins out. I opened a few lids. But I couldn’t do it. The spirit of Christmas swirled around me, but I couldn’t look inside the bins. I was determined to make this a special Christmas. I had a grandbaby to enjoy and my three kids. I had a new home. But Christmas past would not be a part of this Christmas. This Christmas would be new – brand new. I knew that Curly would be impressed with any sort of decoration, and especially if it sparkled. So, I went to K-mart and bought a bunch of shiny, glass (well, plastic – who knew?) balls. Add tinsel and lights and it was really beautiful. The tree sat on a round antique ice cream table. It was perfect. The holiday was perfect. Four generations of family gathered on Christmas day and unwrapped presents from their secret Santa, just as we’d done many times before. The meal amazing, the ambiance perfect – I didn’t even think about those abandoned ornaments. I took all of the bins out of the closet and piled them against the wall, determined to go through them in the new year. I shut the door to the room. With two spare rooms, there was no need to do anything with this room. The other spare room was already made up to be a guest bedroom. Every now and then I’d open the door and look in, or go in to get something. I felt a tinge of guilt that I hadn’t yet done anything with all those red and green bins. Still – I shut the door quickly. Out of sight, out of mind. When my 6ft 4in son came to visit, I didn’t have a place for him to sleep. The bed in the guest room, a pretty trundle bed – wouldn’t fit him. Then my other son shared plans that included visiting more often. And that was it. It was time to get that room in order and time to finally go through those bins and boxes. I pulled them all into the hallway where I could spread out. It was surprising to me that I could do this with such a clear head. Ornaments that were broken but hadn’t been thrown away, were tossed out easily. Strands of gold and silver beads were put in the Charity box, as were outdated and non-sentimental decorations and ornaments. Why is it that I keep things for years and years, even though I hate them? It felt good to continue on this journey to simplify my life. Then came the sentimental decorations. They kept popping up when I least expected it. The special ornaments from travels. The “Baby’s 1st Christmas” ornaments from each of my children’s first Christmases. The ones my aunt, now 89-years old, crocheted. There were the stockings – one for each child. And stockings my aunt made for my ex and I on our first Christmas together. There was a glass ball of the beautiful, Methodist church we were married in. And that hand-carved nativity set. I hadn’t spoken to my ex in months, but decided to send him a text. I told him what I was doing and invited him to come over and go through things with me. Or, as an alternative, I offered to pull out whatever meant a lot to him, so he could have it for his future Christmases. His response was fast. That hit me harder than any of this had. While each decoration brought a memory to the surface for me, it meant nothing to him. Of course, I don’t know what he was thinking. Maybe it was too painful for him. But I don’t think that’s the case. I’ll probably never know. But it felt like he’d taken our marriage to the dumpster behind the corner market and tossed it in – without a thought. I was agonizing over everything and he could throw it all away so easily. I went back to the bins and had to keep myself from saving things out for him. The nutcracker he’d always liked, the baker made out of dough and fabric. But in the end, I put them in the Goodwill box. I finished the task in parts of three days. I whittled down my Christmas to things that truly mean something to me, or that are useful and practical. My Christmas things will no longer take up the entire closet. Most importantly, I’ve made room in not only the closet, but also my life – for more. Not more “things” but more life. It was the first step toward creating a space for my guests – for my sons to come and stay as well as friends. And I’ve simplified this small corner of my home and life. I went from 12 boxes and bins to 6 bins. I got rid of lights that didn’t work. I threw away all broken decorations. I organized what I kept. I donated three boxes of Christmas decorations to charity. Going through divorce after three decades is difficult. My advice? Do what you have to do to get through it. If that means going through your Christmas things in July, do it. If that means hiding the memories in a closet for a year or two, do that. After this experience, the one piece of advice I would give is this; do something to buffer the emotional tasks you’re faced with. If you have to go through photo albums, for example, choose a time when you’re the least emotionally attached (not around holidays, birthdays, anniversaries, etc) and maybe take those albums to a friends house to go through with you. There are no rules for this side of divorce. Nobody talks about it. We have to find our own path. So, grab a glass of wine and your walking shoes – time to find that path!